The Bridgehunter's Chronicles – Bridging our past with the future by preserving our heritage in the present. In New York City, the Verrazzano-Narrows Bridge was officially opened to traffic in a dedication ceremony attended by approximately 5,000 people. United Press International reported, “A brilliant sun shone on the 4,200-foot [1,280.7-meter] suspension span and a cold wind blew across the lower bay of the harbor as a pair of polished scissors split a ribbon on the Brooklyn side of the bridge.” Along with helping to cut the gold ribbon at the dedication ceremony, New York City Mayor Robert Wagner read a telegram from President Lyndon B. Johnson that hailed the bridge as “a structure of breathtaking beauty and superb engineering.” The bridge was named after Giovanni da Verrazzano, who in 1524 became the first European explorer to sail into New York Harbor. Many of the bridges that cross the Thames today are not the first structures to have spanned their sites. There has been a crossing at the site of London Bridge almost as long as there has been a city of London; Saxon crossings, Roman crossings, the fabled medieval crossing of 1209 brimming with buildings, pubs and shops. There have also been two Waterloo Bridges (the first was opened in 1817 and the second in 1942), two Southwark Bridges (the first was opened in 1819 and the second in 1921) and two Westminster Bridges (the first opened in 1750 and the second in 1862). But what becomes of old bridges after they are demolished? Here are five stories of unusual endings. The city’s bridges and embankments have been at the forefront of lighting innovations in London for centuries. They are amongst the first of the city’s thoroughfares to be illuminated – initially by oil lamps, then by gas and finally by electricity when, in 1878, the Thames Embankment became the first street in London to be lit with electrical arc lamps known as ‘Yablochkov candles’ (after Russian inventor Pavel Yablochkov). Here are six illuminating tales of lighting London’s bridges. Mystery Bridge Nr. 112: A double-barreled concrete bridge that used to serve a major road? This is the first video podcast of the bridge. The bridge is between 90 and 110 years old, spans a tributary of the River Zschopau south of Wolkenstein in central Saxony in the suburb of Niederau. The rest can be found by clicking here. Mystery Bridge nr. 112: A double-barrelled concrete bridge that used to serve a main road going to Wolkenstein. Podcast here…. 1. When was the bridge built? Who was the bridge builder? 2. What kind of road did it serve and what industries existed in the area of the bridge? Albeit modern in itself, the next Pic of the Week takes us only a couple kilometers downstream along the Preissnitz before emptying into the Elbe at this crossing. The Waldschlösschen Bridge is one of the fanciest bridges spanning the Elbe in Dresden. The multiple-span viaduct with V-shaped piers and a steel pony arch main span was also known as one of the most controversial bridges ever built in Germany, comparing it to the major projects that were ongoing at that time, like the Stuttgart 21 Project (which is set to open by 2023) and Berlin-Brandenburg International Airport (BER- still ongoing after 13 years). From the decision to build the bridge in 2005 until its final completion in 2013, it took several court cases, the recognition and rescinding of the World Heritage site by UNESCO, over a dozen bridge design drafts and a tunnel on the eastern side before the bridge was finally put together- a span of eight years. Yet when biking along the River Elbe through Dresden, when looking at the bridge, one may see it as a modern eyesore that should not have been built but was a necessity to relieve traffic at the nearest bridges which are both over a century old. Yet when adding the landscape and all the buildings that went along with that, it does conform to the scenery quite well. In the day time, the bridge is surrounded by a lot of green. 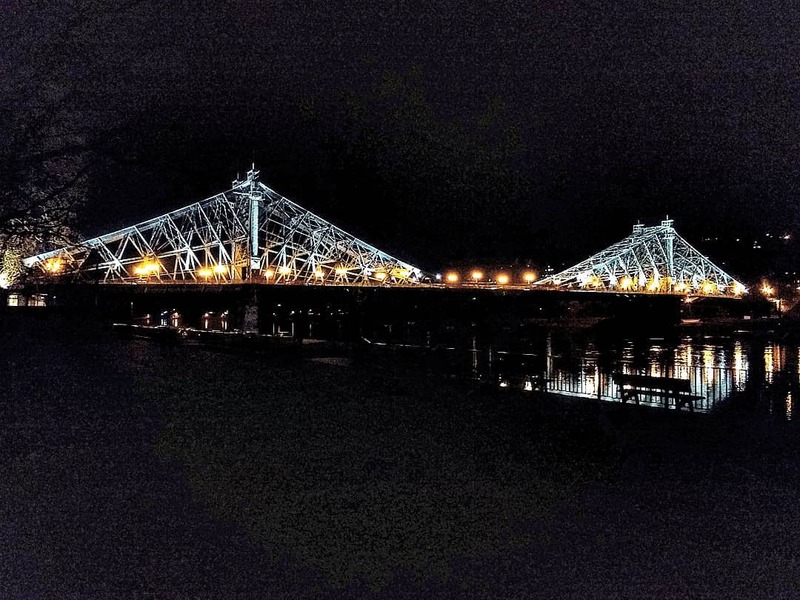 Yet at night, as you can see in the picture, it presents several shades of dark blue, with white lighting from the bridge’s deck reflecting off the River Elbe. The lighting is all LED but they move randomly, based on the cars that cross it in one direction. The shot was taken right after the sun set with he clouds covering the area.